For the Maltese, Owen Jay needs little introduction. His presence has been felt for twenty years bridging the worlds of deep house and techno with his parties and labels Batti Batti and most recently the formidable Gauss imprint with Natan H.
Molegrip is the collab between two veterans from the scene, one of whom Brian James, another Maltese trailblazer, has recently made his mark as a producer, but is most renowned for his DJ artistry and his infamous Unfocused parties. 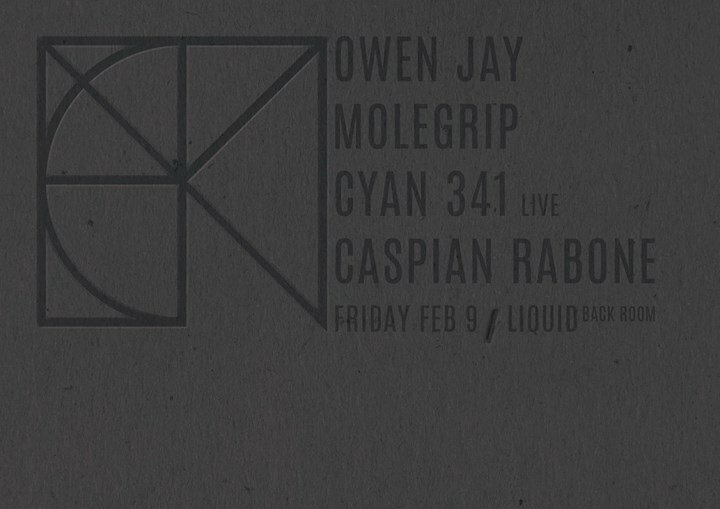 The other Caspian Rabone, has produced and DJed for a couple of decades with releases on several labels, running Polaris records and now launching his new brand Cement. Making his Malta debut Cyan341 is one of those obscure and prolific artists whose released material across many labels including Uncharted audio, Smallfish Records but primarily his own long standing Rednetic Recordings. His Live PA explores the sonic world of sub-bass to delicate bleeps. With a line-up of this calibre and experience it's going to be a night of pure quality. Music that will cross all the realms of techno from ambient, to deep and driving techno.